Is your dog like a cartoon character? When he’s lost do you have a sudden and inexplicable urge to search for him? Does he look good in horizontal stripes? Don’t answer those questions, they are rhetorical. 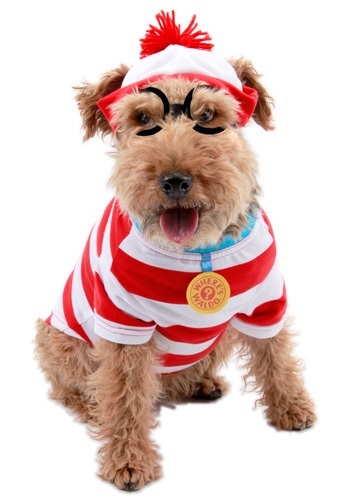 The only question you should take seriously is this: wouldn’t you love to dress up your dog as Woof from Where’s Waldo? If you answered no then we’re not quite certain what can be done for you, but if you said yes you’re in great luck! The Waldo Woof Dog Costume is the canine take on Waldo’s iconic look. With the signature red and white shirt, beanie, and glasses, this dog costume is sure to delight adults and children alike. Did you know Where’s Waldo? is turning 30 this year? We thought there was something wrong with us because we hadn’t found Waldo even once in those three decades -- until someone pointed out to us that we were actually looking at Magic Eye books.